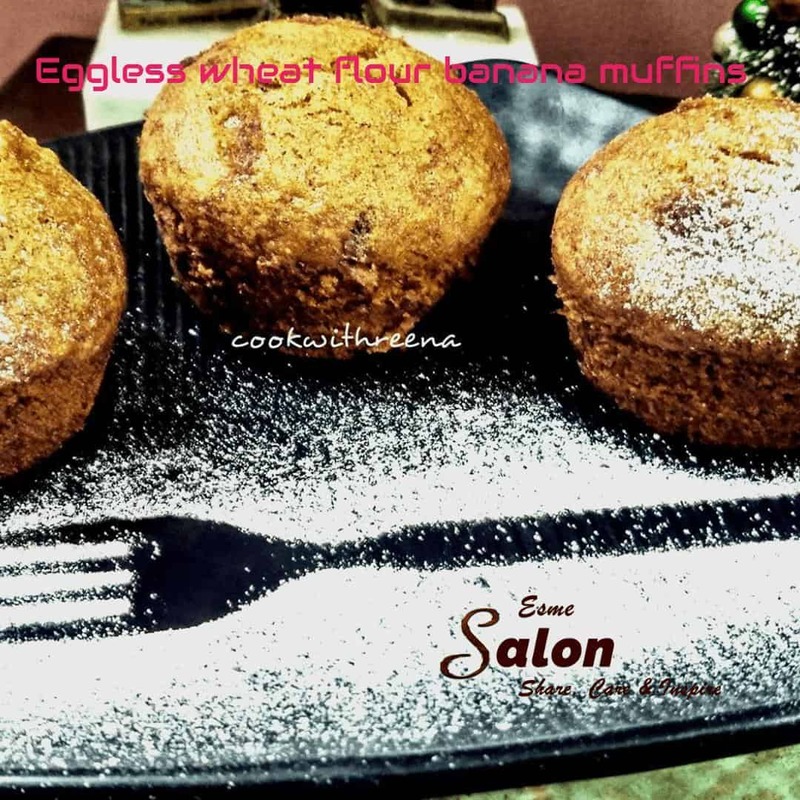 These are Eggless wheat flour banana muffins in Cook With Reena!‘s kitchen. Please visit my friend Reena, and see what else she has to offer. Preheat oven in 200 degrees C.
Line up the muffin tin with oil. Set aside. In a bowl sieve flour, baking powder, baking soda, salt, and cinnamon powder. Set aside. In another bowl whisk together oil and brown sugar till smooth. Add mashed banana and combine nicely. Add buttermilk, vanilla essence and mix. Now pour the wet ingredients to the dry ingredient. Mix well in cut and fold method till well combined. Do not over mix. If using nuts then add it now. Pour the mixture in greased muffin tray till 3/4th is full. Bake it in 160 degrees for 20 mins. Check if not done bake it for another 5mins or till the toothpick inserted in the middle of the muffin comes out clean. De-mould the muffins after 5 mins and cool it on a wire rack. Note: If not consumed immediately then wrap each muffin in cling foil to keep it moist. Preferably Warm before every serving.